My oldest son's tween bedroom is finally complete! Good thing, too, as he'll be a teenager this summer. Gulp! 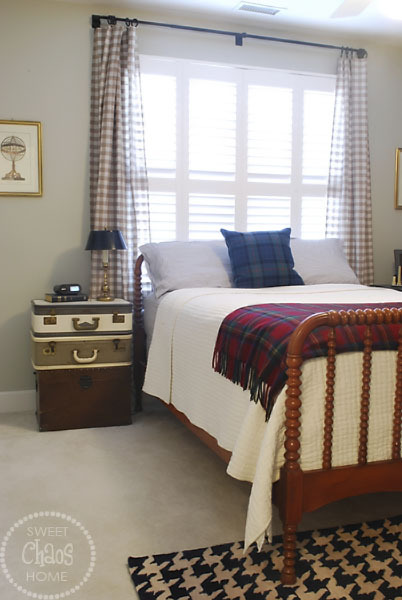 I really enjoyed working on a more grown up, masculine bedroom. With 4 little boys, I've had my fill of decorating with light blue, dinosaurs and cars. As a mom, I'm not wishing those things away. But from a design perspective, I was up for a new challenge. Here is a "before" shot of the room. At the time, it belonged to my youngest son, who had just moved out of a crib. You can see the room has a rather funky layout. It's the smallest of the bedrooms and the angles make furniture placement challenging. We played a game of musical bedrooms, and my oldest took over this space. The room was designed around the antique bed I found on craigslist. There was really no option other than placing it in front of the window. But, I actually like how the window frames the bed. 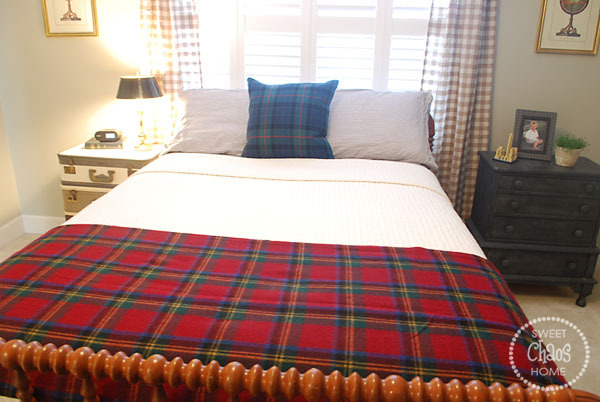 The bed is dressed with striped sheets, an ivory quilt and a tartan wool blanket. 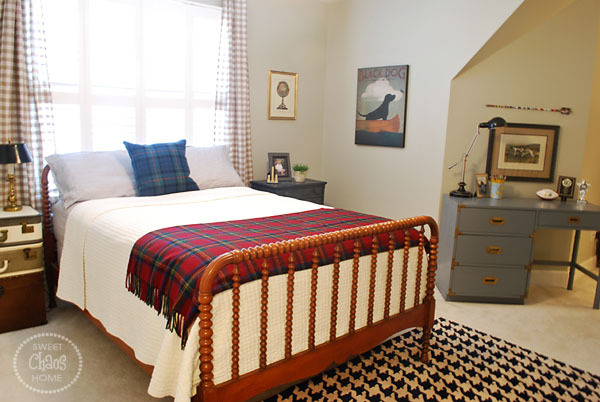 I knew I wanted plaids in this room, and after an exhaustive search I was lucky to score the blanket at Home Goods for $40. I like mixing plaids. This pillow came from William Sonoma. I thought about adding more pillows and shams, but let's face it. This is a boy's room. The pillows will never find their way back onto the bed in the mornings. Best to keep it simple. 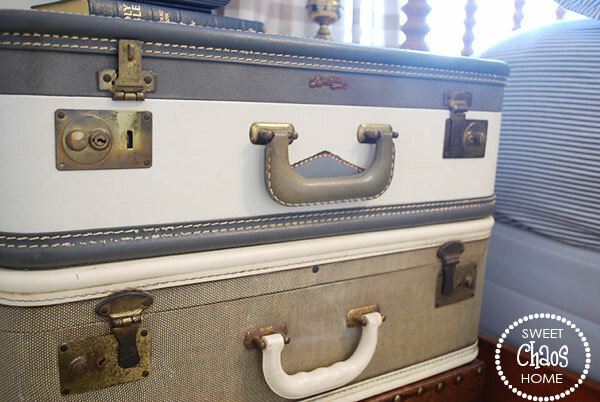 On one side of the bed, I stacked some vintage suitcases atop a small trunk. I like the texture and character they add to the room. 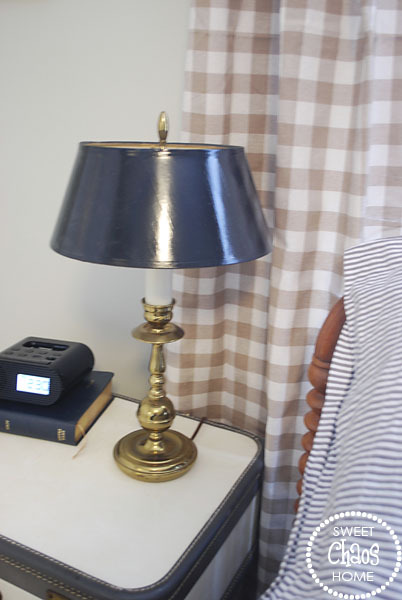 This small brass lamp was hanging out in my parent's attic. I gave the shade a little makeover, and now it fits in perfectly. There were other furniture makeovers as well. 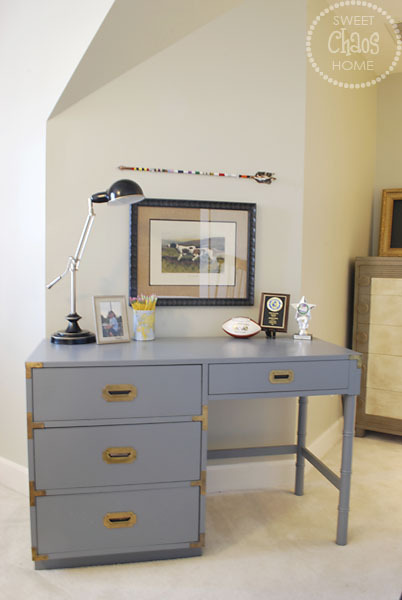 This campaign desk was a craigslist find that got a facelift with fresh paint. 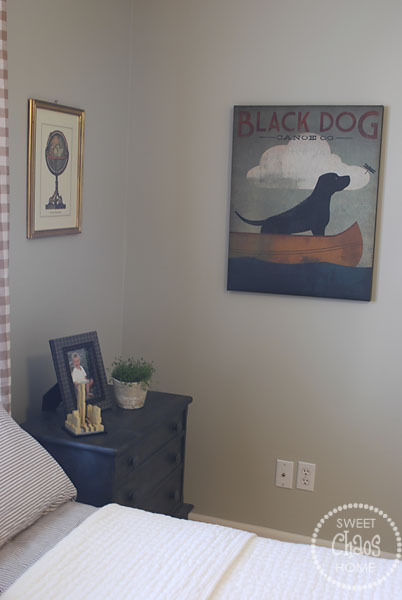 The desk lamp and framed dog print are from HG. 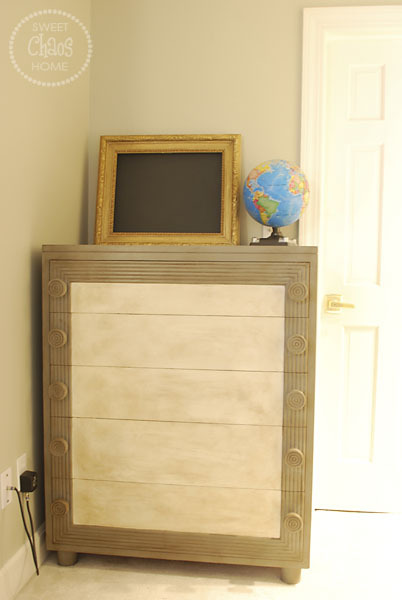 This formerly blonde dresser has been passed down for generations, and I gave it a new look with chalk paint. You can see the transformation HERE. The frame on the dresser contains a cork board. I painted the cork with graphite chalk paint. You may recall that I had done a large chalkboard gallery wall on this side of the room. But, I have to admit.... it wasn't working for me. It looked too cluttered. And, the last thing I need in my kids' rooms is more clutter. 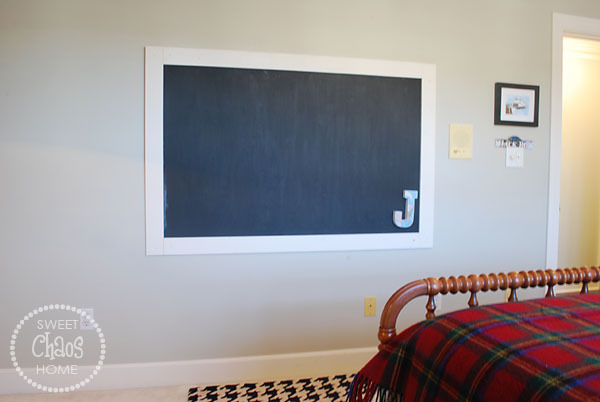 I decided to simplify and just frame out a section of chalkboard. 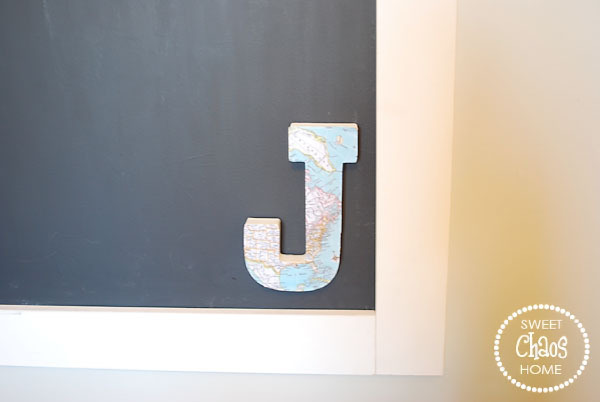 I put the mod podge initial I made in the corner of the chalkboard. Through the door back there is a jack and jill bathroom. (In this house, it's known as a jack and jack bathroom.) You might spy a sink area in the back right corner of the bedroom. I'll be sprucing up that area as part of the bathroom's mini-makeover. You might have noticed we went with a bit of dog art in the room. 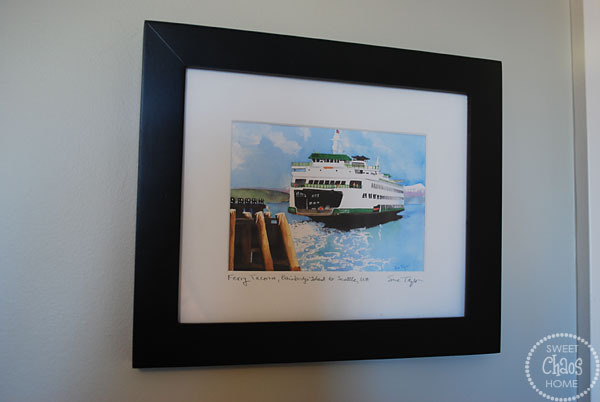 Another piece of art that is close to my heart is this one of a Bainbridge Island ferry. When my oldest sons were 3 and 2 years old, we spent several months living on Bainbridge Island. Sadly, they don't remember it. But, this is a nice reminder to me of an adventurous time in our lives. 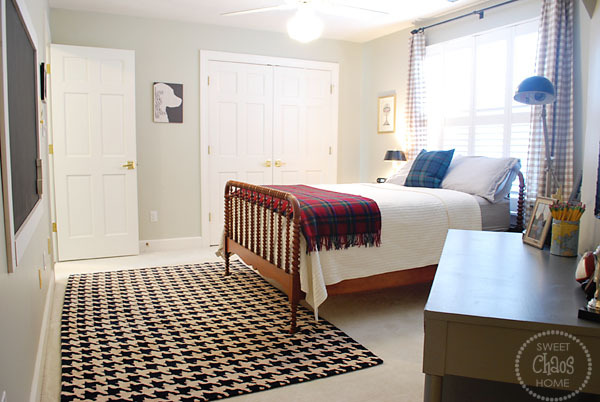 Of course, I couldn't resist adding another plaid into the mix with this houndstooth rug. I scored a great deal on it at a local design shop's annual clearance sale. And that's the tween room in a nutshell! I love this room, and find myself just staring at it from time to time. I hope you like it, too. Because honestly, my son could probably care less. Oh, he's polite about it and tells me that he likes what I'm doing. But, I'm sure a mattress and a pillow would have been just fine with him. The room is perfect! I love every detail - the checks, plaid, houndstooth, colors... 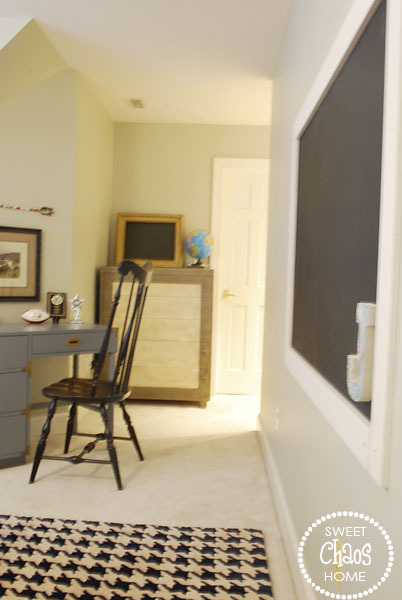 Boys rooms can be so hard to decorate and you did an awesome job! Carolyn I LOVE the way his room turned out!! I just finished my oldest daughters room and promised my son I would redo his next, ya know what he wants in there TURF CARPETING...NOT HAPPENING!! Boys!?! I love this room. 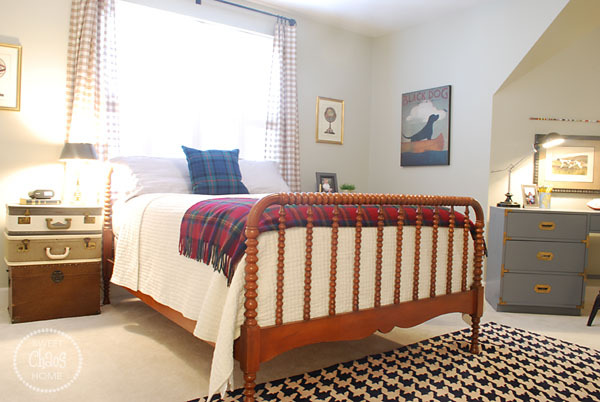 The plaids, the houndstooth rug, the antique bed...really just perfect. Love it! 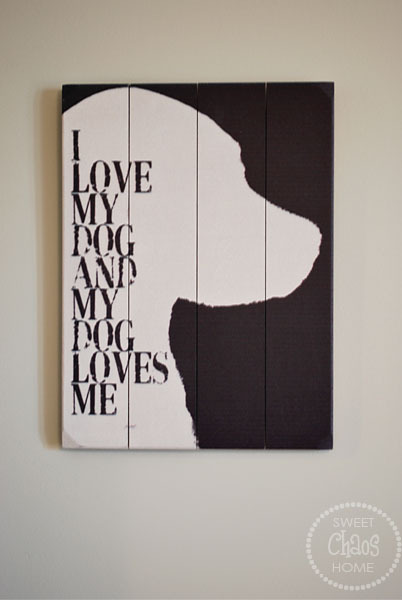 And the dog art is so cute and adds some black which is awesome. Fantastic room! Great job. love it! very masculine and i love the blend of rustic and vintage! Wow!Such a great space for a teen:) I love the window treatments and the side table lamp is so pretty. I like your choice of bedding and the desk is the perfect size. I absolutely love this room. 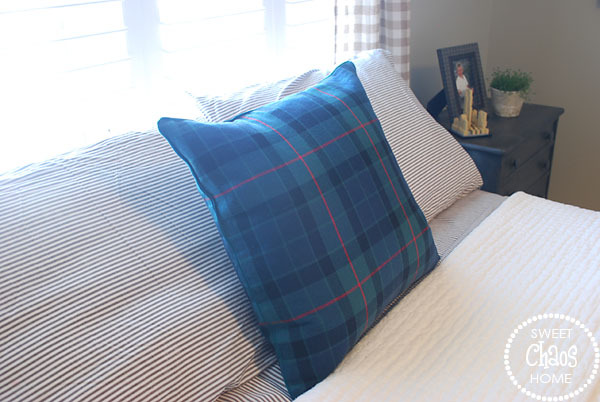 I love the soothing colors and the mix of plaids. I love the artwork and the mix of sentimental pieces with thrift finds. Everything works so well together. I can see why you just stare at it....it's stare worthy! Since I have a new teen boy myself (whose room we've been redoing too!) I especially love this room! Love the plaid, love the dogs, love the mix. And I'm so with you on the pillow thing -- had to fight for just one decorative pillow on my teen's bed!! This may be a super weird thing to say as I am very much not a tween boy, but I LOVE this room and would be totally thrilled to have it as my own space. It is amazing! Great job! Great tween room. 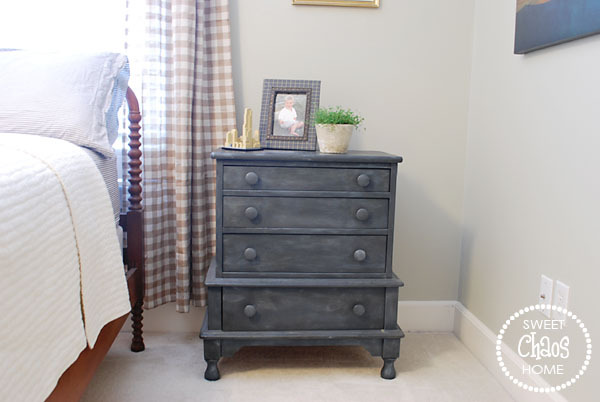 Love the dresser makeover!! This is perfect. You sure have been busy at your house. Are you getting things done before baseball/soccer/golf/swim meets????? 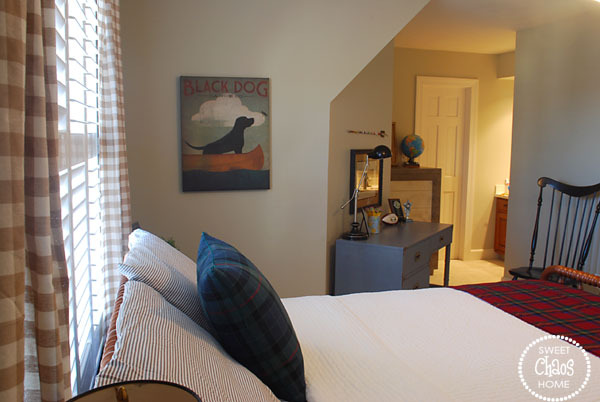 This is a fantastic tween boy's room, you have done well! I found you through Wow Us Wednesdays where I shared my bookcase makeover. What boy wouldn't love this room? Great job. Nice clean simple lines. Amazing Carolyn! I bet he walked in and let out a little boy WHOOP! Very nice tween room. I love the color of the walls.And how it contrasts with the white door and trim. What is the name of the color and which brand of paint did you use? I just came across your blog from My Sweet Savannah and I'm am dying! Gorgeous!! I'm about to start making over my twin boys bedroom and I think I'm seeing some plaid in my near future... Thanks for the beautiful inspiration I definitely will be following along from now on! How did you do the dog memorial picture? Also how did you fix the chalkboard mine did the same thing? I love this room....so many great things! 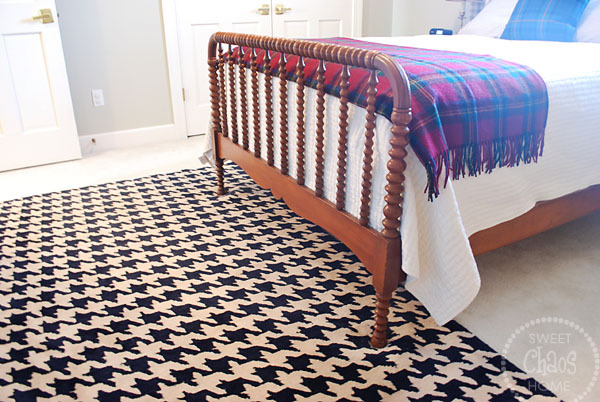 The houndstooth rug is wonderful and I must start looking on CL again because so many people are finding great things! I love this room! I think it's lovely- your boy is lucky!